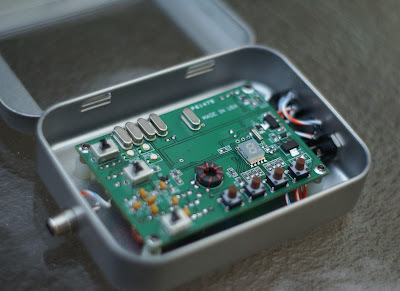 Today's blog entry will focus on Steve "Melt Solder" Weber's new Mountain Topper Radio (MTR for short). The MTR is another fine radio in the AT_Sprint lineage and I've seen it described as a sort of "ATS3c". It is a 2 band - any pair from 80, 40, 30, or 20 - 5w Altoids tin transceiver with RIT, a DDS VFO, 3 keyer memories, and even the capability to do PSK (with external hardware). Of course this is a surface mount kit but don't let that put you off! I was a bit aprehensive myself but found the assembly to be very enjoyable, though it was somewhat challenging. You don't improve if you don't try new things! The radio took me about 8 hours to build I think, but that sounds like a lot. I did not use tweezers so it made placing the parts a bit difficult and I think that made it take longer. No less, I enjoyed every minute of the build and had absolutely no problems following the instructions. This is something you CANNOT do without a maginfying glass or microscope though! I would have been lost without one. So after the build process, the calibration and setup is pretty straightforward. A second receiver (a KX3 in my case) is all you need really, though some other equipment comes in handy peaking the receive filters. On first power on, the DDS was already within 100Hz of the desired frequency and once I calibrated it, RBN spots showed me right on frequency, which is always nice. I hooked it up to my 4SQRP QRPometer and my 8 NiMH cell pack at 10.1v and read 4w on 20m. Really stellar performance for a radio that fits in an Altoids tin! That case looks really nice - a lot classier than an Altoids tin. The rig looks great TJ - and you sounded FB on 20M too! Wish I could have been your first QSO with the MTR but I'm glad I was at least one of the first ones. 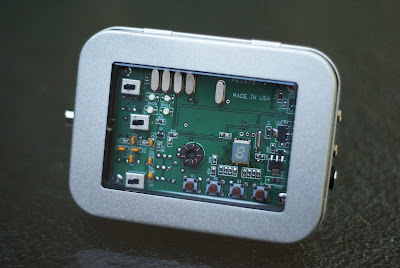 Very nice case and it sure is fun with those SMD parts. I have to change an SMD part in my Elecraft K3. It was part of a mod but just doing one SMD was enough for me. Great looking work on the board. Very nice job TJ and a neat choice for a case. My wife works for Lowe's and I've seen those holders but never thought of a different use for them. Thanks for the contacts while we've been on summits under the NE1SJ call.